Yusho is the only restaurant in Las Vegas that would have made a bigger splash (and been a bigger hit) had it opened off the Strip, instead of (literally) on the Strip. 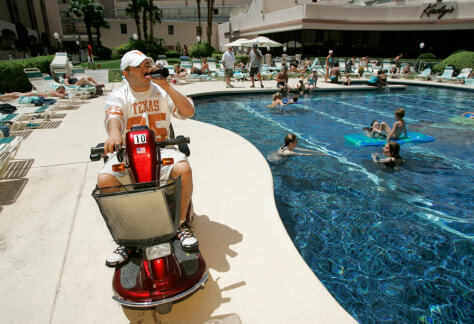 To be more precise: on a Strip-facing corner of the Monte Carlo Hotel and Casino, where tourists seeking another artisanal beverage stroll on by (oblivious to the mastery before them), and locals wouldn’t venture if the beer were free and Joël Robuchon was the sous chef. Calling this location challenging is an understatement. It’s easy to miss, even if you’re “strolling on by” the front of it. If you are forced to drive there, expect to endure the always-aggravating Monte Carlo parking situation, and then an annoying stroll amongst the low-rent fannypackers who stay there. If Yusho was located on Spring Mountain Road, it would be a tougher ticket than Raku. As it is, you can just stroll on in, any time of the week or weekend, and eat some of the most unique food Las Vegas has ever seen. Bold, compelling, uncompromising, intense, and one-of-a-kind are just a few of the phrases that leap to mind as you dive into Matthias Merges’ small but mighty menu. Totally unlike anything the Strip has seen since China Poblano opened in 2010, will be another. Merges was one of the operatives behind Charlie Trotter’s Restaurant Charlie, when it opened way back in 2008. You remember Restaurant Charlie don’t you? 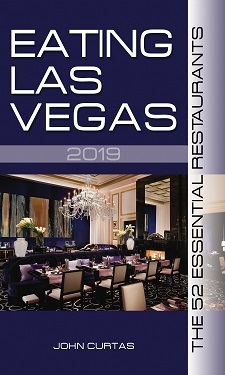 (For a brief two years, it had some of the finest food (and drinks, and desserts) Las Vegas had ever seen. Turns out, he was one of Trotter’s honchos responsible for the quality-control, innovation, and drop-your-fork deliciousness that made Charlie so famous. Fourteen years with the owl-eyed one taught MM a thing or three — one of which is to pack a punch with what you serve, and don’t hold back when you find a new flavor combination that works. This is Japanese street food interpreted through the sensibilities of a world-class chef, and neither the seasonings nor sacraments are sacrificed. Rather than watering things down for the bland and picky American palate, Merges kicks up both the quality of the ingredients and the flavor profile several notches, à la David Chang and Andy Ricker, creating his own vernacular of this food in the process. …that slides down your gullet like a stripper on a pole. Like the restaurant and Merges, it is sui generis, head-scratching and game-changing all at the same time. This is a significant restaurant. Ignore the unlikely (and inconvenient) location, and taste for yourself. And be prepared to drop your chopsticks in appreciation. Max Jacobson (Max hasn’t been well enough to review Yusho, but if he was, here’s what he would say): I did my time in Japan years ago, and find this food as bland and boring as an Al Mancini article about ice cream. If you must have your bowl of ramen (yawn) or veggie tempura (double yawn), I suppose Mathias Merges’ amped-up take on these dishes is preferable to the watered-down versions you usually get over here. He is obviously in love with this cuisine, but from his name, you would think he would share my love of Mittel European cooking like cepelinai, ceburekai and bebrienos troškinys (beaver stew). Pity. Recommended dishes: Tuna with Jalapeno; Octopus with Haricot Vert; Chicken Wings; Logan Poser Ramen; Duck Breast; Aged New York Strip Steak; Duck Leg; 2X Fried Chicken; Veggie Tempura; Crispy Cod; Pork Shoulder; House Pickles; Assorted Kim Chi; Crispy Fried Oysters; Soft Serve Caramel Fernet Branca Ice Cream; Basically the whole friggin’ menu + the house-made, killer cocktails from a keg.